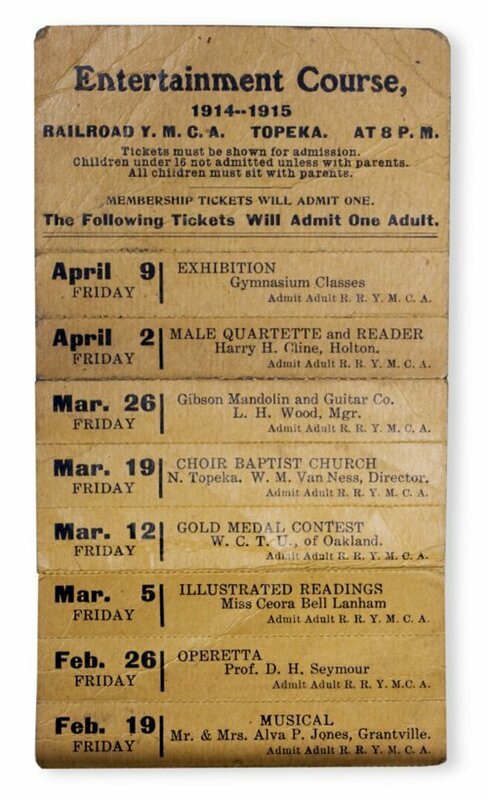 Entertainment course tickets for the Railroad Department of the Young Men's Christian Association in Topeka. The Railroad YMCA. was started in 1880, but not organized into a department of the state association until 1885. Its object was to "provide a home for employees who were without home privileges," giving them a wholesome home environment, baths, libraries, etc. The Atchison, Topeka & Santa Fe Railroad company appropriated $1,200 per annum for this work, and donated the use of a two-story brick building.